CityAds - Affiliate CPA network reviews and details. 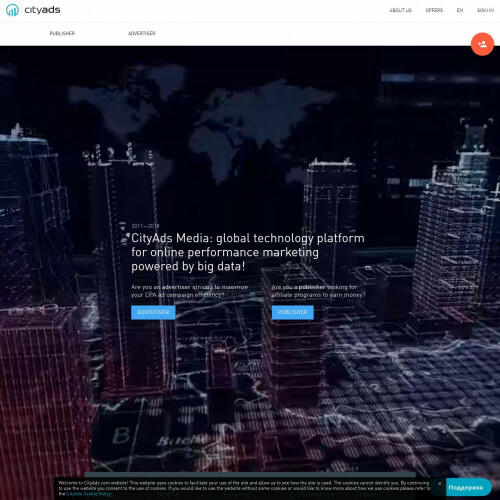 Wanna know which affiliate network is the best and why is it CityAds Media? We are trusted: 150,000+ affiliates, 200,000+ affiliate sites, 2,600+ advertisers. We pay more: we take as little commission as possible to give you the highest rates on the market. We pay on time: automatized payments as often as you need them. Any payment system you can think of. We monetize everything: any vertical, any type of traffic, more than a thousand offers to choose from. We support you: 24/7 support in tickets, competent managers, friendly approach. We get you what you need: any additional materials and landing pages. Just request them. We give you all the tools: our in-house platform can accommodate all the special needs. We welcome you: easy to sign up, easy to get started. I work with CityAds for 1 year almost and can't say nothing bad. Good support, payments on time, many offers on the platform. I can recommend it. Keep your eye on the news!